While you can always come down to Chosen Art Tattoo and receive great work, we would like to give thanks to the brave men and women that are out there everyday keeping America and our local communities safe. To show our appreciation, we are extending 20% discounts to members and Veterans of the Armed Services (Army, Air Force, Coast Guard, Navy & Marines). Bring your Military ID to receive the discount! First responders, including Fire Fighters, EMT and Police with proper identification can enjoy a 15% Discount. 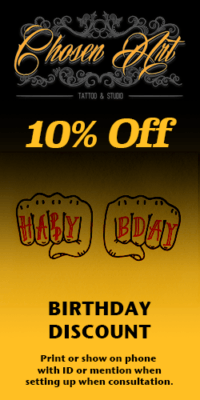 Also If a tattoo is part of your Birthday plans, we offer a 10% discount for those!